Although Tampa Bay doesn’t have colorful, high-relief coral reefs like the Florida Keys, it does have areas of fossilized corals, limestone outcroppings, rubble and artificial reefs, collectively known as “hard bottom.” In fact, research from the Florida Fish and Wildlife Conservation Commission (FWC) is showing these rare habitats may serve as a critically important stop-off for juvenile fish as they graduate from nursery areas in the bay to offshore habitats in the Gulf. A Spanish mackerel glides past the cameras and bait box, confirming their use of hard bottom in Tampa Bay. FWC’s Fisheries Independent Monitoring Program has been sampling fish populations in Tampa Bay since 1989, documenting species and size in different parts of the bay. 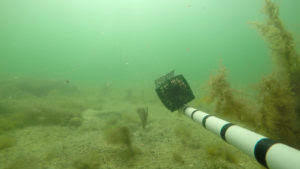 The new research, funded through the Tampa Bay Environmental Restoration Fund, uses video technology and high-tech fishing apparatus rather than the traditional seine nets to document what species are utilizing specific habitats. Using the new methods, scientists have documented 19 fish species in quantities equal to or greater than captured in nets over the past 21 years, including three species never seen before in Tampa Bay and 11 that were rarely observed. The results also reflect a dramatic increase in the total number of fish documented, with significantly less effort: 64 stations measured in this study vs. 337 net hauls. Multiple species share hard bottom habitat, including the spade fish, grey snapper and grunt captured in this image. 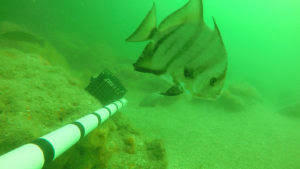 Researchers used two GoPro video cameras, mounted on a PVC frame with a bait box to attract fish, that were dropped on hard bottom habitat for 20 minutes. 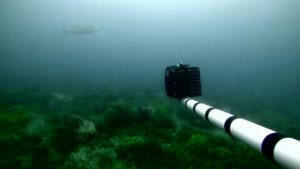 Dual cameras provided “stereo” vision allowing researchers to identify fish as well as their size without capturing them. Immediately after the cameras were retrieved, hook-and-line fishing gear was deployed in the same area on timed intervals to minimize the impact of an individual angler’s skill to collect additional data from the fish that can’t be collected looking at videos or pictures. Pinfish and a stingray also share hard bottom habitat. And because the hard bottoms often have very low relief, they may be covered (or uncovered) by sand during heavy storms. “If we can’t see them anymore, we need to be able to know where they’re likely to persist,” Burke adds. Like much of the bay, hard bottom habitat and the organisms that live there are threatened by direct damage from fishing gear or other physical impacts, stress and disease, and invasive species. The time is ripe for studying hard bottom habitat in Tampa Bay. Last summer Florida Department of Environmental Protection (DEP) staff began a monitoring program, to better understand how these habitats change over time. These hard bottom habitats have a complex network of organisms that attach to and live there. “We have historic snapshots of hard bottom — like the Environmental Protection Commision of Hillsborough County’s report on benthic invertebrates on artificial reefs — but this important monitoring work will aid in the understanding of these habitats,” Burke said. 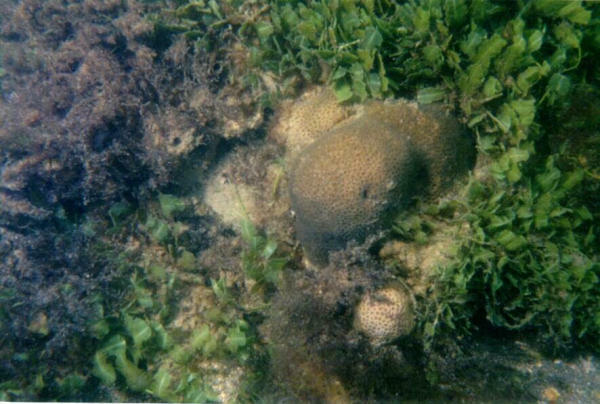 Example of hard corals in Tampa Bay. Photo provided by Florida Department of Environmental Protection.